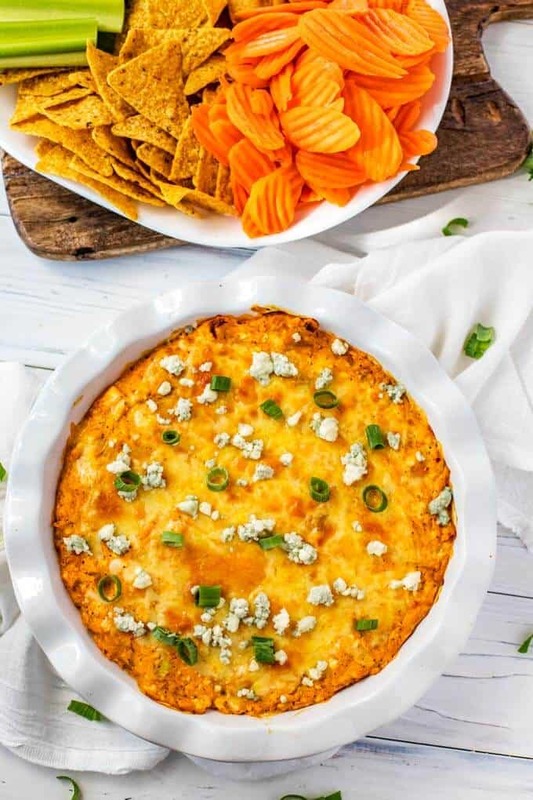 This Healthy Buffalo Chicken Dip is good for so many different occasions. It is fabulous for tailgating or football parties but works equally well for a potluck or family gathering. Truth be told, my kids would be thrilled if I were to serve it for dinner on a random Wednesday night. It is spicy, cheesy and oh-so-delicious. This one may have you scraping the edges for that last bite. But I am going to say it too. I cannot BE-lieve it is August. I know some of you mourn the end of summer, but this girl loves fall. For one, I look forward to being able to do simple things like go to the grocery store without feeling like I need a shower five seconds after walking out the door. Plus, football season will be here before you know it. And you know what that means. Football food! Whether you are tailgating at a College game (Go Gators! ), or prefer to catch the game a home, chances are that food will play a major role in the festivities. 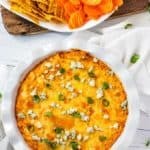 I typically plan my menus a week or two ahead of time, and this Healthy Buffalo Chicken Dip is one that makes a regular appearance. It is a crowd pleaser and I am a sucker for anything that can be made ahead of time. Now let’s be clear, healthy is a relative term here. 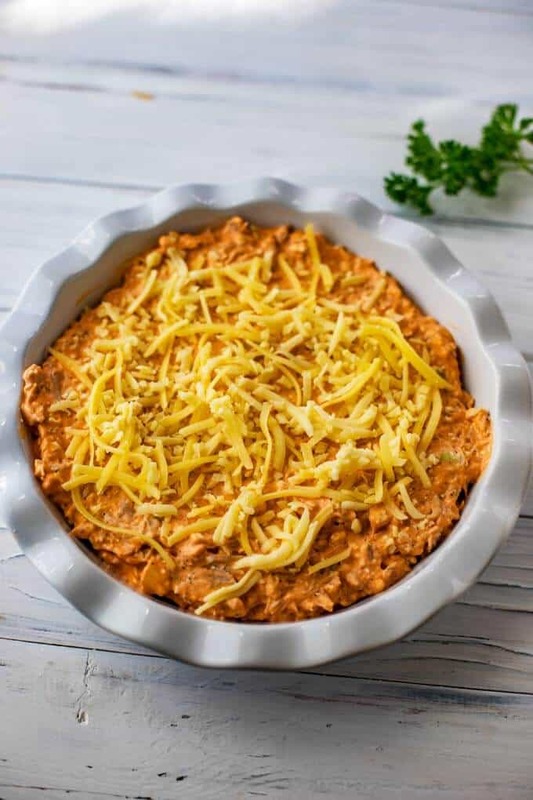 I think I probably should have titled this “Healthier” Buffalo Chicken Dip, because there is just no making a dip like this that rivals a kale smoothie for nutritional value. But once you get past that, I think you will agree that this recipe delivers on all of the flavor while keeping the calories somewhat in check. The secret weapons are Greek yogurt and cottage cheese. I have used these in place of cream cheese and sour cream, and I don’t notice a difference in flavor and texture versus the “real thing”. This is a good thing. Because I am not exactly known for my restraint when it comes to game day snacking. 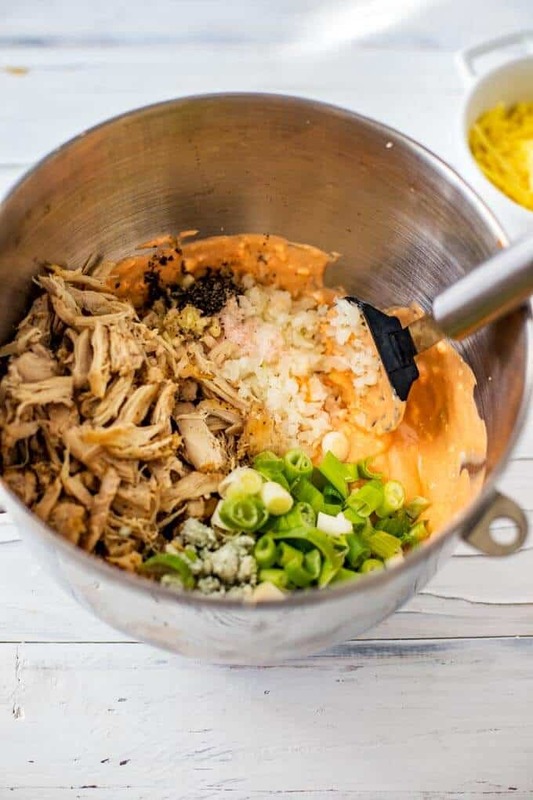 Can You Make Healthy Buffalo Chicken Dip in the Crockpot? Yes! Simply add the dip to a prepared slow cooker and cook over low for two to three hours. How Long Can You Keep Buffalo Chicken Dip in the Fridge? This dip can be kept in the fridge for up to three days. I like to make this in my stand mixer to ensure that everything is well mixed together and the mixture is creamy. An immersion blender or a hand mixer will also work well. If you don’t have any of those, you can whip it together with a whisk or a spoon. If you do this, make sure that the cream cheese is well softened and be prepared for some vigorous beating! 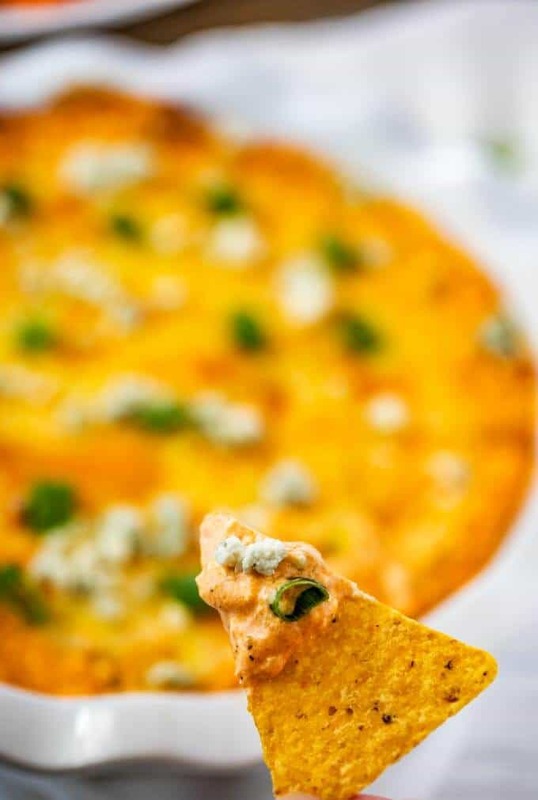 This Healthy Buffalo Chicken Dips is perfect for your clean eating diet. With Greek yogurt and cottage cheese, this easy to make recipe can also be made in your crock pot. Dairy Free, Keto, Keto and vegan options. 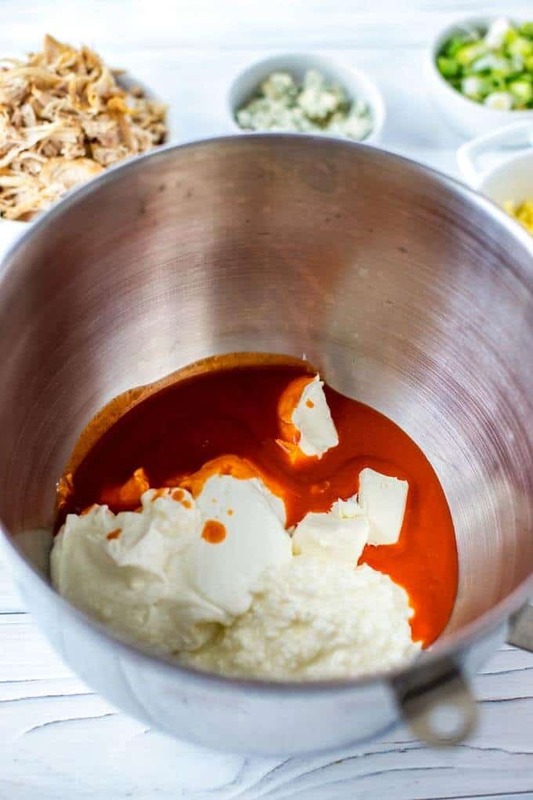 Beat together Neufchâtel cheese, cottage cheese, yogurt and hot sauce with an electric mixer until smooth. Stir in chicken, blue cheese, scallions, onions, garlic, and seasonings. Transfer to a 9-inch pie plate. Top with Cheddar Cheese. Make it Vegan: Use 8 ounces of vegan cream cheese in place of the Neufchâtel Cheese and cottage cheese. I am a big fan of Kite Hill, which is a nut-based cheese. They have a Jalapeno flavor which is super-spicy and would be great in this if you like things really hot. Use non-dairy yogurt, and either tempeh or chicken substitute (like Beyond Meat or Gardein) in place of the chicken. Omit the blue cheese and top with Daiya Shreds. Make it Dairy Free: Follow the same instructions for making this recipe vegan, but leave the chicken in. 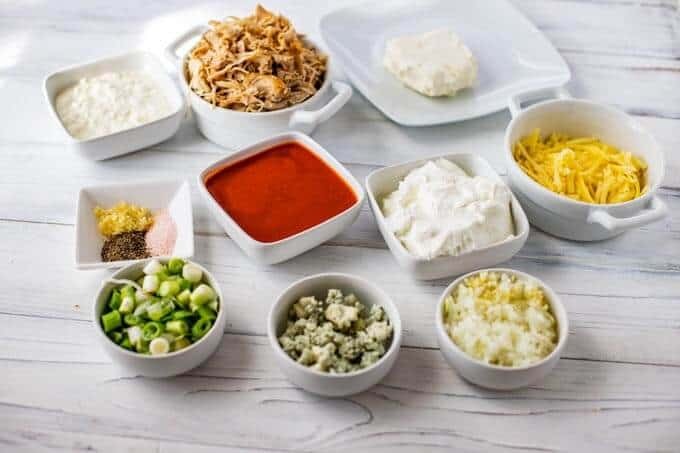 Make it Keto: Use 8 ounces full-fat cream cheesen place of the Neufchâtel Cheese and cottage cheese, and sour cream in place of the yogurt. Serve with carrots, celery, and cauliflower. You can use mozzarella in place of the cheddar if you wish. I have a gathering coming up this weekend and this recipe will hit the spot with my guests. I am looking forward to trying it out! Thanks for sharing. Let me know how it goes! I hope that you enjoy it as much as we did. I just had dinner but I could eat all over again! they look so so good! i love a good dip! i am going to try them for sure! What a great looking dip. I bet my husband would love it! This looks so good!! I haven’t had buffalo chicken dip in a while, looks like I’ll be making it this weekend. I’ll have to give this recipe a try. Thanks for sharing! This sounds amazing. I will definitely give this a try. Maybe at my book launching party in October. This is such a great post. Looks like a great and delicious dish. Thanks for sharing! I’ve been on a buffalo kick for a few days now…let’s be real, a few weeks now and I don’t see myself laying off anytime soon lol! This looks so yummy and I’m already craving it, but those carrot chips! How have I not thought about those!? Definitely going to be in the next snack arrangement I make! This looks so delicious! This would be perfect to make for the upcoming football season! This looks delicious! Perfect for a family movie night or end of summer cook out. I love how it’s tasty and healthy. Ohhh, this looks yum. I’m a big fan of autumn as well. Perfect weather, not too cold and not too hot. Also, your photos look great.